Are robots really impacting the field of public relations? Is a highly empowered audience a threat or an opportunity? How can our organizations be as effective at ‘listening’ as they are at ‘messaging’? With change occurring at an astonishing rate, PR professionals have the opportunity to seize, or suffer from, the new landscape of fake news, content shock and a growing recognition of the business value of reputation and relationships. 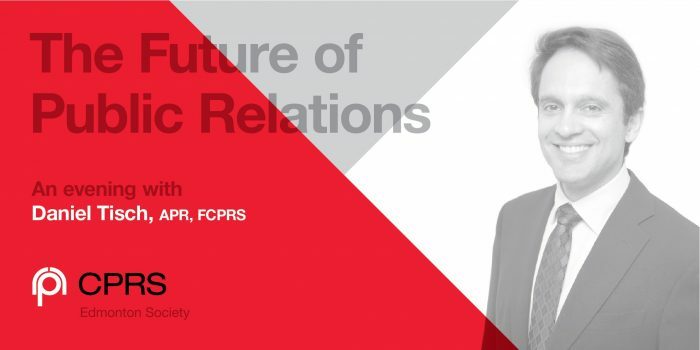 CPRS Edmonton is thrilled to have Daniel Tisch, APR, FCPRS, join us to explore these topics, digging deep into the megatrends facing PR practitioners. Daniel Tisch is the President & CEO of Argyle Public Relationships and the Past Chair of the Global Alliance for PR & Communication Management. 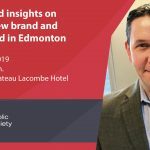 Daniel Tisch is also the author of The Elevation of Public Relations white paper, which was recently released by the CPRS National Society and is the subject of a Canada-wide conversation. The white paper examines the profession’s present – and its possible future. Written in collaboration with senior public relations professionals from across the country, the paper explores the seven megatrends facing practitioners today and discusses the role public relations can play in helping organizations build better relationships and increase trust with consumers, audiences and stakeholders. Since Daniel became president of Argyle in 2003, the firm has grown dramatically, appearing in the PROFIT 500 list of Canada’s fastest-growing companies in both 2015 and 2016. Argyle is invariably among the leaders in awards from the Canadian Public Relations Society and the International Association of Business Communicators, with almost 200 local, national and international awards during Daniel’s tenure. Born in Madrid, Spain, and raised in Toronto, Daniel speaks English, French and Spanish. He holds two degrees from Queen’s University — a Bachelor of Arts in Political Studies and a Master of Business Administration. Daniel is a member of the Queen’s University Board of Trustees, a leader in the international Scouting movement and a board member of Social Venture Partners International.